In a large bowl, mix the flour, salt, yeast, 1 tbsp olive oil and 300ml warm water, to make a soft dough. Knead by hand for 10 mins or with the dough hook in a food processor or mixer for 5 mins. Put the dough back in the cleaned out mixing bowl, then cover the bowl with oiled cling film. Leave to rise for an hr in a warm place until doubled in size. Meanwhile, make the filling. Discard any tough basil stalks (leave tender ones on) and put in a mini food processor or hand blender beaker with the black olives. Add 4 tbsp olive oil, the garlic and the anchovies, if using. Whizz to a rough paste. Heat oven to 220C/200C fan/gas 7. Line a shallow baking tin about 30 x 20cm with non-stick paper. On a floured worktop, roll out the dough to a rectangle roughly 30 x 40cm. Spread the olive paste all over and arrange the whole green olives in a line down one of the short edges. 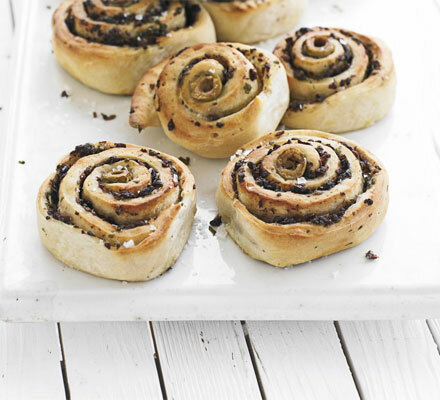 Roll up the dough like a Swiss roll, starting at the short olive-encrusted end to make a sausage shape. Cut the dough into 12 slices, then carefully lift each one into the tin, to make 4 rows of 3 swirl shapes. Lightly brush all over with the remaining olive oil. Loosely cover with cling film, then leave to rise for 20 mins or so, until slightly puffed up and filling the tin. Cook for 20-25 mins until golden, then leave to cool in the tin.